As Nigeria marks ten years of democracy, former head of state, General Muhammadu Buhari, former vice president, Atiku Abubakar and former presidential candidate and secretary to the government of the federation, Chief Olu Falae, yesterday said that there was nothing to celebrate. They said instead of celebrating, Nigerians should join hands with promoters of the proposed mega party to mark what it called the First Electoral Reform Day. Speaking during the ceremony in Abuja, General Buhari openly declared support for the formation of the mega party to checkmate the Peoples Democratic Party (PDP) during the 2011 elections. “There is nothing to celebrate as we mark ten years of democracy in Nigeria. What we are celebrating today is the Electoral Reform Day and not the Democracy Day. “Every Nigerian should stand up to be counted as a supporter of the formation of a mega party,” Buhari said. Buhari threw his weight behind the formation of the party, adding that he was always being briefed on the activities of the proposed party. 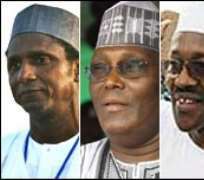 Atiku was represented by one Ahmed Yusuf, who said that the former vice president was an active supporter of the Mega Party Movement. He also chided PDP and its “cohorts” for allegedly bastardising democracy in Nigeria. Atiku, he said, was in support of the struggle for free and fair elections in Nigeria, adding that that the era of “carry-go” politics is over. Falae who was the chairman of the occasion, also said there was nothing to celebrate on the tenth anniversary of democratic governance in the country. Also, he said the Mega Party Movement would soon present a private members' bill on electoral reforms to the National Assembly. The chairman of the Conference of Nigeria Political Parties (CNPP), Alhaji Balarabe Musa also allayed concerns that the proposed mega party would be stunted by too many presidential aspirants. He explained that the party by 2011 would only present a consensus presidential candidate to the support and admiration of its members.